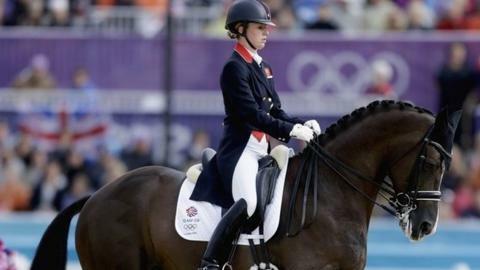 Double Olympic dressage gold medallist Charlotte Dujardin and her horse Valegro broke their own world record to win the FEI World Cup Grand Prix in Lyon. The pair scored 87.129%, beating the 85.942 they set at last year's European Championships. They will hope to add to their World Cup success in Sunday's freestyle to music event. "I honestly can't believe it," Dujardin, 28, said. "Valegro is just getting stronger and stronger every year. You just think that's his maximum, there is no more, but every year it seems to be that there is just a bit more and a bit more. "I have got such a great partnership with him, and he just gives me so much confidence." Dujardin holds the world records in all three elements of her sport - the freestyle, Grand Prix and Grand Prix Special. Silver in Lyon went to Germany's Helen Langehanenberg who scored 83.343 with her horse Damon Hill NRW.